What better way to learn design thinking than to invent the fantastic objects that fill an extraordinary life; a seat for a merman, a music player for a ninja, a remote control for a giant. 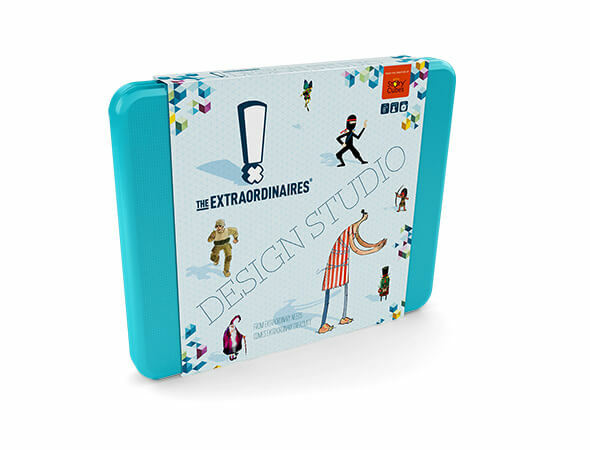 The Extraordinaires is a design studio for children to explore their creative problem solving skills in the most challenging and exciting environments. 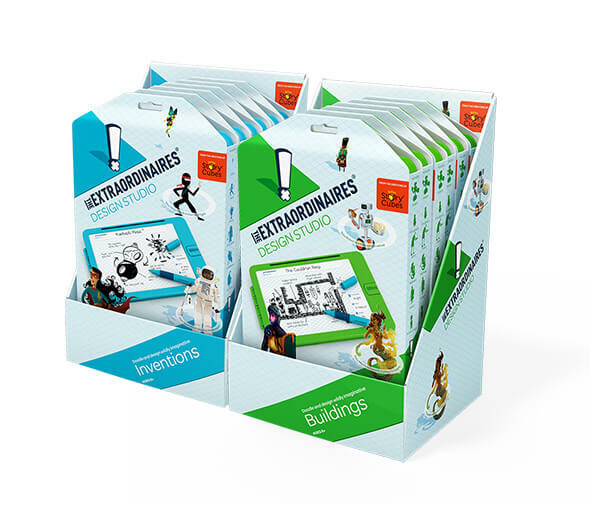 The Creativity Hub, creators of Rory’s Story Cubes, in line with their ethos – helping people to build imagination, self-esteem and empathy through creativity – recognised a need to bring design thinking tools to the classroom. 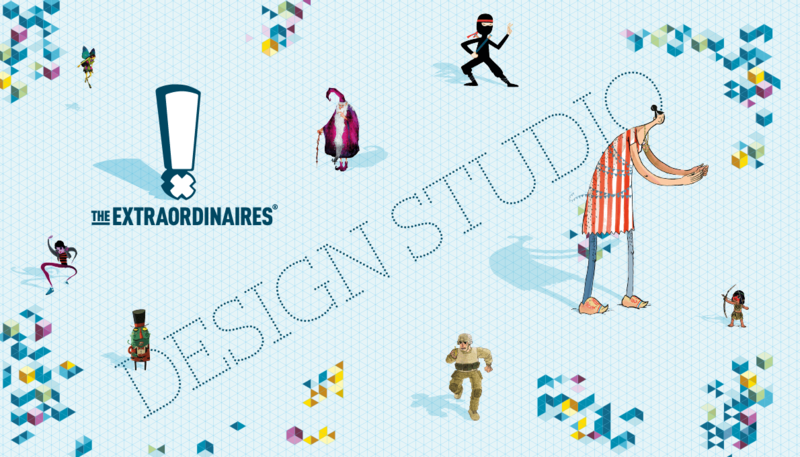 It led them to develop ‘The Extraordinaires’ –fifteen larger than life characters with extraordinary needs e.g. a giant, a Teenage Vampire, a Tribeschild, an Evil Genius. By selecting a character and an object the player is challenged with an extraordinary problem to solve, and a product to create, e.g. a Superhero needs a drink carrier, a Wizards needs something to sit on. 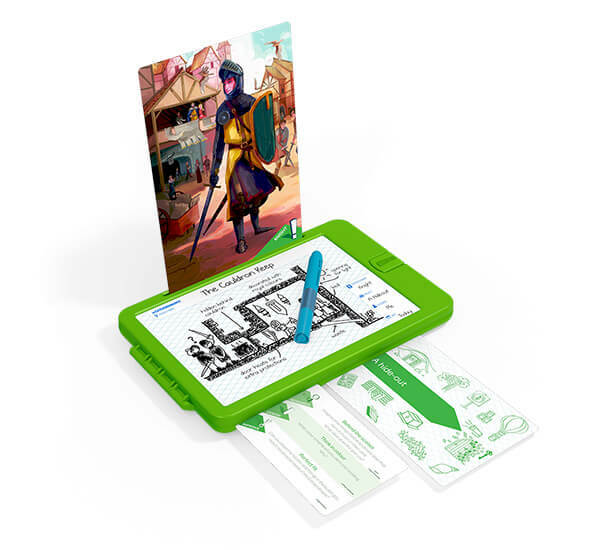 The player then uses the game idea pad to name, draw and annotate their problem solving product and, if playing in a group, present it. 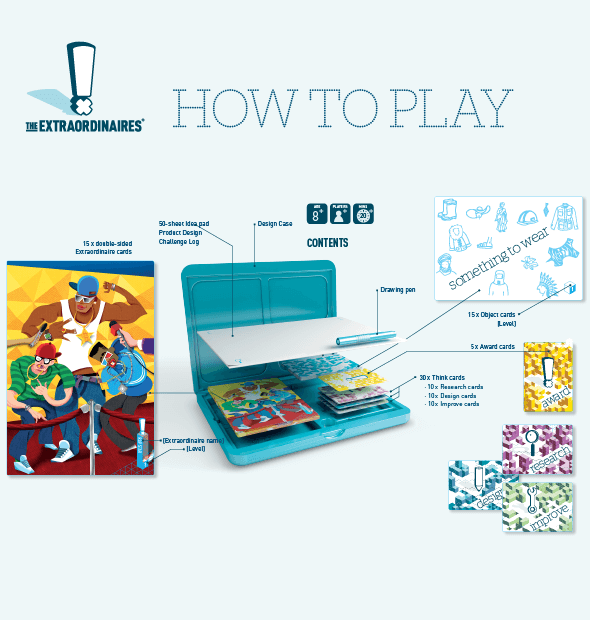 ‘Think’ cards help the player to do more; Research – find out about the Extraordinaire from the illustrated cards and their visual hints, Design – consider what environment the Extraordinaire operates in, or Improve – iterate their design and revise. 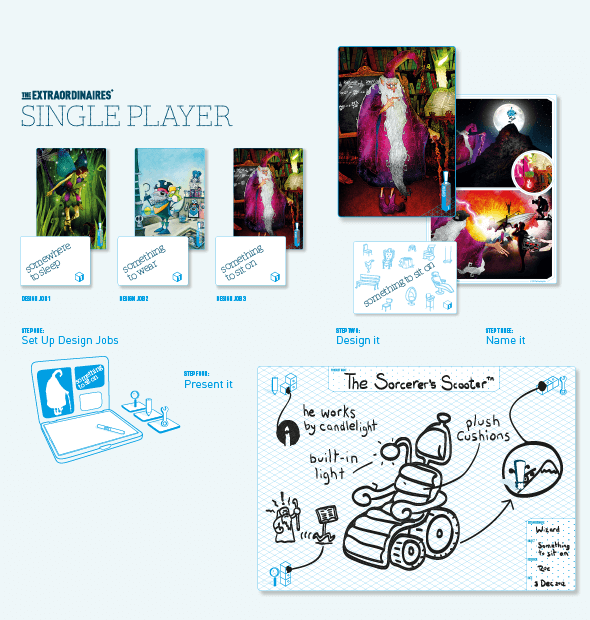 We created an identity system that pulls together multiple illustration styles under one coherent brand and sets the game world in the visual style of a modern product design environment; worksheets, CAD wireframe drawings, digital screen layouts providing a convincing workstation for a child to own. 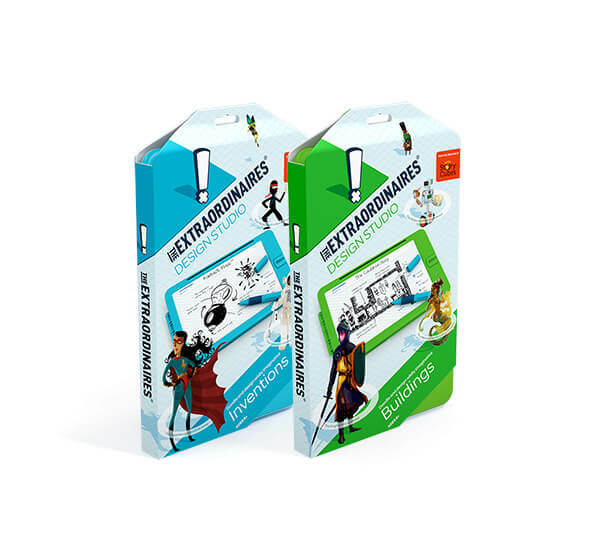 The travel sets, designed for working on the move, are an expansion that focuses on particular aspects of design; buildings, inventions, gadgets, clothing. 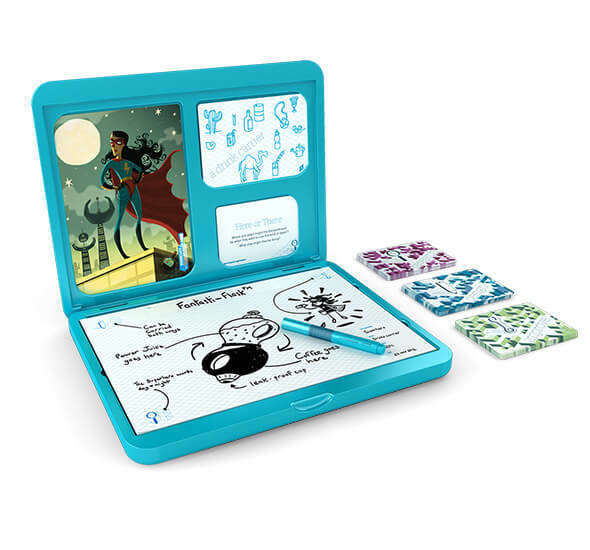 The result is a game product that communicates the developmental aspects in a fun and engaging way, allowing children to build confidence in their own creative ideas. Roll the cubes. Make a story.